Last season saw fetishistic lacquered masks at Alexander McQueen and all over white body paint for a spectral yet serene look at Rick Owens. We take a look at the artists who went above and beyond for AW15, to create padlocked mouths, pearl-decorated faces and bleeding lips – charting this season’s top ten most extreme transformations. The famous Mayan-influenced Hollyhock House by Frank Lloyd Wright inspired Rick Owens this season. The structure led the designer to present a collective of golden girls with faces that radiated like the sun – a sacred symbol to the ancient civilisation. 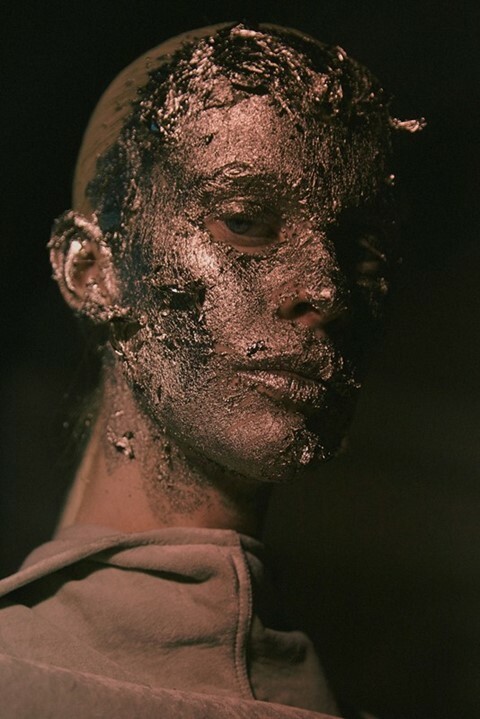 Owens’ models looked like other worldly creatures with crumbling, metallic foil faces created by make-up artist Lucia Pieroni. The master of theatrics John Galliano returned with a collection riddled in the uncanny. 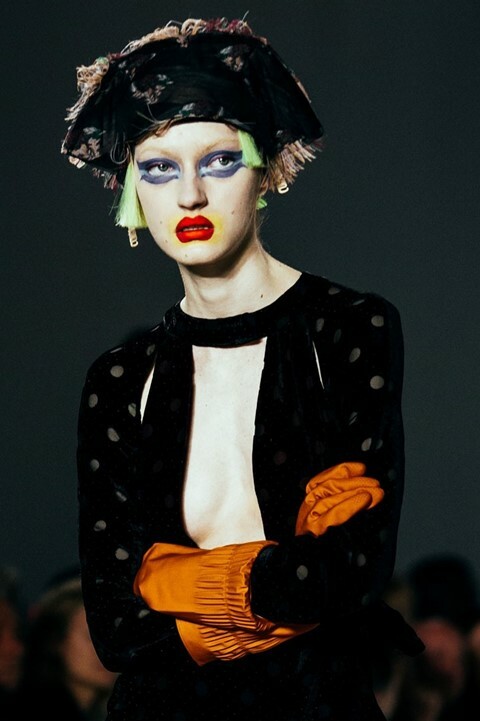 Pat McGrath made John Galliano’s hunchbacked girls look as eccentric as they seemed, with Siouxsie Sioux-esque eyeliner strokes made up in Ziggy Stardust colours. In almost deranged doll-like looks (finished off with rainbow wigs), mouths were blotted with yellow and lips rimmed with a potent red which extended past the lip line – for pouts which were swollen and startling. Tomihiro Kono's 60s headpieces from last season were replaced with all black latern-style structures for AW15. Junya Watanabe traded Isamaya Ffrench's taped red lips and grease-painted eyelids for felt-tip scribbles of algebraic calcullations which took over models’ arms and necks, as if to explain the careful geometry of the garments. After seven years in Paris, Gareth Pugh returned to London with a clear vision: rule Britannia. The designer commemorated his homecoming and ten years in the business with a collection steeped in twisted patriotism. 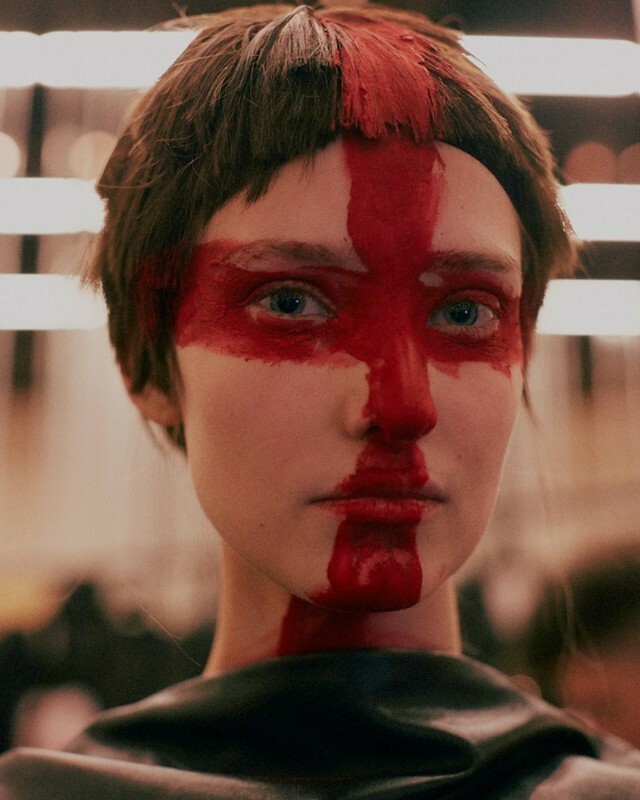 To mark the occasion, Saint George’s Crosses were painted in thick, bloody strokes across models’ faces by the designer’s long-term collaborator Alex Box. Inspired by both his own family and the likes of Lady Di, the CSM grad brought his friends out on the runway for AW15, silk-robe clad and covered in gold, in a celebration of kitsch and British working-class culture. 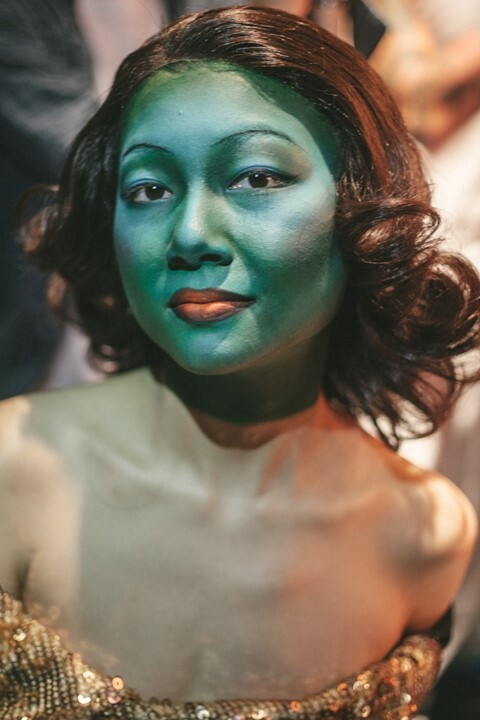 Proudly representing these aspects of britishness was a green-painted lady in sequins – inspired by the infamous, often reproduced “Chinese Girl” painting by Vladimir Tretchikoff. 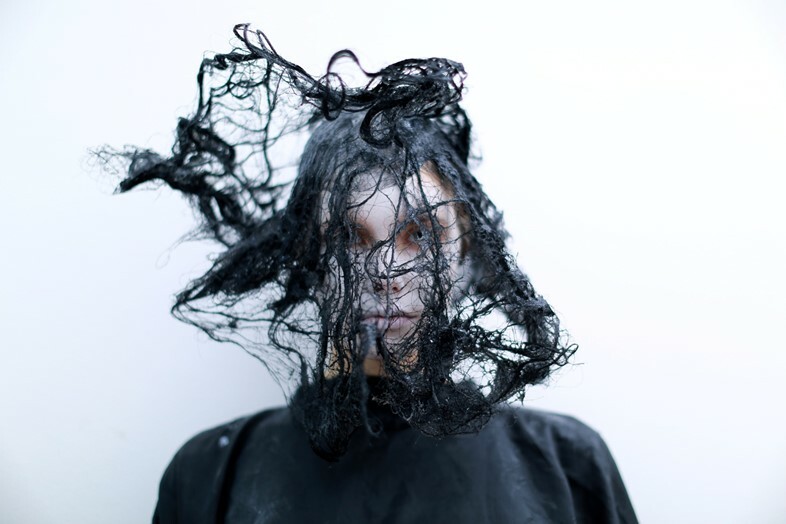 For AW15, Rei Kawakubo’s women marched down the catwalk in monumental textile representations of loss – and as the beauty to complete their mourning could be no less than intricately perfect, Julien d’ys’ spiderwebbed hair creations gave the impression of organically developed mourning veils enshrouding the models’ faces in deep grief. Read the hair pioneer’s gems of wisdom here. Pat McGrath worked her magic once again, as Riccardo Tisci's girls stepped out in ornate facial jewellery, with bejewelled septum rings, pearl drop face studs and chandelier-style earrings in abundance. Hair was slicked back with baby hairs gelled down. With all that decoration, make-up just wasn't needed, as McGrath kept faces near bare. “Beautiful but fucked up” was the look Elizabeth Ammerman and Eric Schlösberg were going for this season. Their self-made “furry hospital” was populated with half-dead girls – as make-up artist Mark Carrasquillo gave their petrifying patients bruised, blood streamed eyes, ravaged lips and ripped ears. The duo even sported the look themselves, to tie in with the macabre appearance of their gory lolitas. 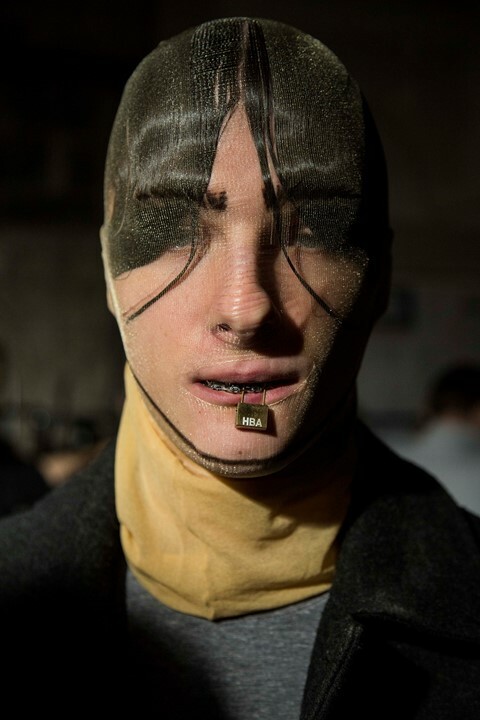 Perspex neck shackles and false white eyelashes have featured at Hood By Air in the past. This season, Shayne Oliver’s fetishistic show (going under the apt title ‘Daddy’) saw models with pantyhose over their heads and padlocks on their mouths – like a disturbed game of cops and robbers. Brows, sideburns and jaw lines were drawn over the top in black, adding a strange definition to the squished features. "UNISEX" was the title of Vivienne Westwood's Gold Label collection this season, as she sought to bring gender specific styling to an end. 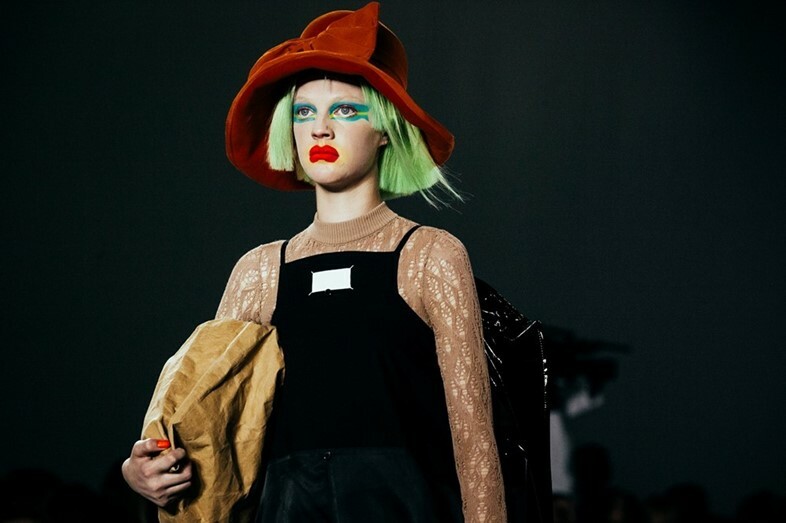 Val Garland translated the designer's activism in to facial make-up – with felt tip boyish scrawls and dashes of pretty glitter, finished with drawn-on furrowed brows which perhaps signified anger and resilience towards gender division.